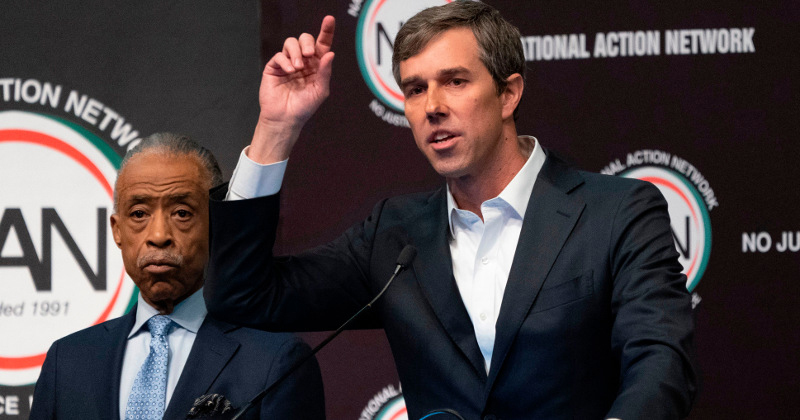 Robert ‘Beto’ O’Rourke told Al Sharpton he would “absolutely” sign proposed reparations legislation if elected president. Appearing at Sharpton’s 2019 National Action Network convention this week, O’Rourke voiced his support for a bill put forth by Rep. Sheila Jackson Lee (D-TX) which would establish a commission to study injustices against African-Americans and recommend remunerative action to rectify those societal inequities. “So, absolutely, I would sign that into law,” O’Rourke concluded. A video clip of O’Rourke’s remarks shared by NBC News has received more down votes than up votes, and top comments are dominated by viewers accusing the failed Senate candidate of “pandering” for votes. Fellow 2020 Democrat hopefuls including former San Antonio mayor Julian Castro, Sen. Elizabeth Warren, and Sen. Cory Booker have also expressed their support for Rep. Lee’s legislation, according to the Associated Press. An article in “The Week” warns that Beto supporters should not idolize their 2020 pick. Alex discusses how the left’s cult like mentality is being revealed.